Chef Silvestre Rincón-Tellez, executive chef of Tuk Tuk Real, and chef Tom Puthongdee, chef de cuisine of Circles Thai. Chef Alex Boonphaya of Circles Thai loves to host intense cooking competitions. 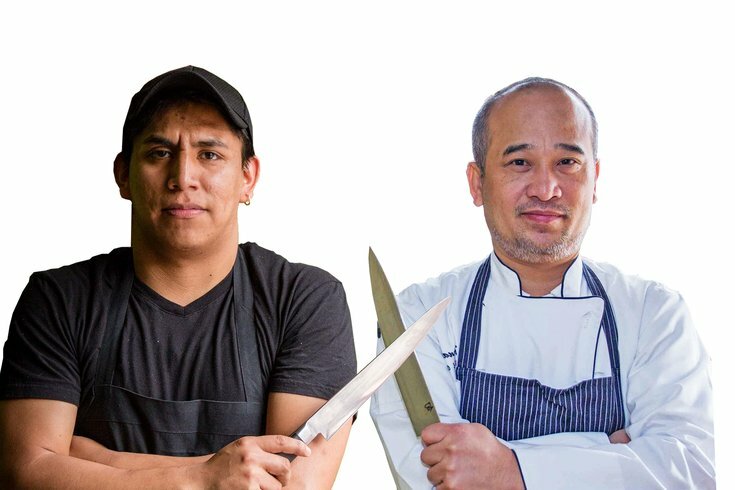 The third installment of his Thai Knife Fight series is coming up Thursday, May 21, and he'll be pitting his two "top chefs" in a battle for bragging rights and a sweet knife. Tuk Tuk Real's executive chef Silvestre Rincón-Tellez will face off against chef Tom Puthongdee, chef de cuisine of Circles Thai. The battle goes down at Circle's NoLibs location, and lucky guests will blind-test and then vote on the three courses each chef prepares. The winner takes home a Korin Japanese chef knife. But, like any good cooking competition, there's a twist: the chefs' dishes must include foraged-for ingredients sourced within Philadelphia, plus a secret ingredient of Boonphaya's choosing that must be present in each dish. Rincón-Tellez worked in El Vez, The Dandelion and The Capital Grille before joining Circles Thai in 2013. In 2014, he and Boonphaya opened Tuk Tuk Real on South Street. Puthongdee is Boonphaya's brother-in-law and worked as corporate chef at Sup Sip Thai Restaurant in Jakarta, Indonesia, before moving to Philly and into the role of sous chef at Circles last December. Call (267) 687-1309 for reservations to this friendly competition.